Last Friday Microsoft released Windows 8.1 to the general public as a free update for all Windows 8 owners. In addition to the interface changes that we noted in our previous examination of the Windows 8.1 Preview there have been some under-the-hood optimizations in the latest iteration of Microsoft’s operating system. AMD published a new blog post coinciding with the launch of Windows 8.1 detailing a significant performance increase for Richland-based systems running on Windows 8.1. 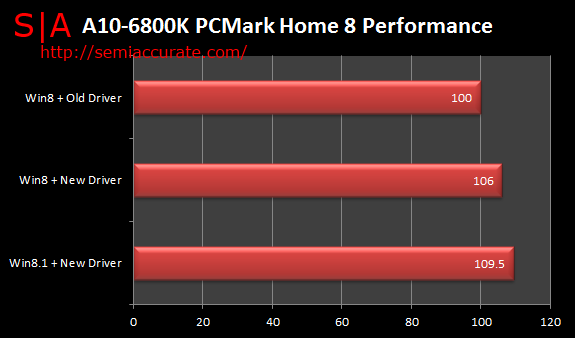 AMD’s September update to Windows 8 video driver for APUs resulted in a six percent increase in performance in the PCMark 8 home test on an A10-6800K APU, a model which we reviewed in June. Using the same driver and platform with Windows 8.1 AMD’s internal testing showed a nine-point-five percent uplift over the old driver running on Windows 8. 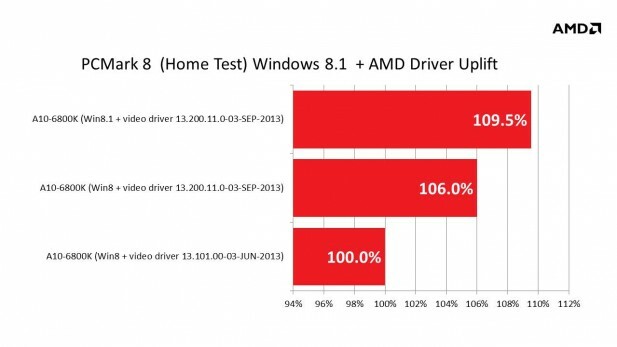 Considering that AMD’s new driver was responsible for six percent of that uplift, it appears that whatever Microsoft has done in Windows 8.1 has boosted the performance of AMD’s APU by just under five percent in this particular benchmark. The blog post fails to identify a meaningful reason for this increase other than to cite, “…the dedicated AMD technical staff that works on site alongside critical developers and product groups at Microsoft…” Of course it’s expected for new operating system iterations to provide superior performance to older versions on the same hardware; so this news doesn’t come as any big surprise. But I’m sure that current APU owners will be happy to see that AMD is still actively working on optimizations and performance enhancements for their systems even with a refresh of the AMD mainstream APU product line on the horizon. AMD was betting heavily on the success of Windows 8 and its deep partnership with Microsoft. But despite turning a small profit last quarter AMD’s competitive position in the Windows ecosystem remains in question. Intel is attacking the small-core low power x86 market aggressively with its Bay Trail SoC and its insurmountable production capability. Although AMD’s rollout of the Kabini and Temash SoCs was promising it appears now that those chips have largely managed to replace AMD’s older design wins rather than bringing the company new business opportunities. Additionally the Windows segment of the PC market has shrunk significantly since Windows 8 was released and alternative operating systems like Android and Chrome OS are making major inroads in the tablet and low-cost laptop markets. This puts a lot of pressure on AMD which has no major presence in either market despite being, on paper at least, a viable competitor in these two cost-sensitive categories. Updated: 12pm October 22, 2013 Added better slide comparison below.